As a Physics Groupie and science aficionado I’m always seeking out worthy scientific causes to support. Science needs benefactors and there are many ways to show your support for research groups, their personnel and their experimental direction. I’ve done this kind of thing for years, and I intend to continue as I believe it is vitally important for the general public to demonstrate their commitment to the areas of scientific research they favor. Of course it’s no secret my choice of areas are physics, mathematics and astronomy. I recently found out about a very worthy cause, to help the famed Mt. 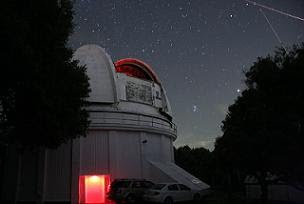 Wilson observatory in southern California with repairs and fire protection. An informative article recently appeared in the Los Angeles Times, “A renewed effort to save Mt. Wilson” that reached out to me. I plan to add this to my list of scientific causes to support by joining the Friends of Mount Wilson Observatory in order to get involved. Mt. Wilson, if you recall, was in serious danger of being destroyed by the long-burning Station fire back in August/September of this year. The L.A. Times story recounted the experiences of the observatory’s faithful superintendent Dave Jurasevich who braved the flames to stay atop the mountain during the direst of times to do what he could to assist firefighters around the grounds. The loss of Mt. Wilson would have been catastrophic to the world of astronomy. This was the site of landmark discoveries such as Edwin Hubble’s finding that the Milky Way is not the only galaxy in the universe and that the universe is expanding. Please consider lending a helping hand to this venerable site of astronomical discovery. If astronomy isn’t your cup of tea, seek out ways to support your favorite areas of science. It certainly feels good to know you’ve done something in support of scientific progress.